Join us this summer for the 31st Annual ShopRite Nutmeg State Games Track & Field Meet hosted by the City of New Britain! This is a great opportunity to compete in a statewide tournament in Central Connecticut. This year's Track & Field Meet will be hosted by Veterans Memorial Stadium (Willowbrook Park) in Saturday, July 13th. The Track & Field Meet is sanctioned by the USATF. Age cut off date for all Age Groups will be 12/31/2019 - following USATF Age Divisions. Participants need to supply their own implements. Starting Blocks will be provided. Admission for spectators is $5.00 for adults, $3.00 students and senior citizens. Participants will be allowed 4 jumps and/or 4 throws. There will be no FINALS. No limit in Jumps unless the athlete fails three jumps in a row. Turbo Javelin will be held on Javelin runway in the throwing area. 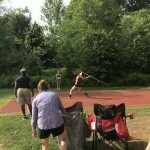 The Nutmeg State Games Track & Field Meet is sanctioned by the USATF. Please Note: you do not have to be a USATF member to compete. The Track & Field Meet is an open competition. Non USATF Members are allowed to compete. The newly renovated 9-lane oval track circles a regulation-size football field. The track was dedicated to coach Irving S. Black in April 1992. Seating is all in metal bleachers, with 7 sections of 27 rows each on either side of the field. The estimated capacity is 8,448. Other features include: track runway for the javelin, shot put throwing area, four long jump pits, two pole vault stations and two throwing cages for the discus and hammer. The stadium is owned by the City of New Britain, and is part of Willowbrook Park. Parisi Speed School - Official Training Partner of the "Games"
Please see the Meet Schedule for Field Event Start Times and the Track Event Order! Registration is Now Open for 2019 Meet! ​$35.00 will allow participants to compete in up to two (2) events. Participants will be allowed to compete in a maximum of five events.